My grandmother’s cornbread was a crisp golden brown. It was cast iron. It was a mason jar of bacon grease kept in the cupboard and a jug of buttermilk in the door of the Frigidaire. It was “home again home again jiggity jog”. It was Lincoln logs. It was sitting at her dining room table looking out the sliding glass door onto the back porch where we cracked walnuts and my brother and I smeared lighting bugs onto the pavement in senseless acts of childhood iridescence. It was torn into pieces into a glass of milk and eaten with a spoon. It was badminton and the smell of birdseed. It was childhood, and it was her. Until a month or so ago when I finally decided to make it myself, I hadn’t tasted cornbread like hers in fifteen years, really didn’t eat cornbread at all. Didn’t bake it either. It might as well of died along with her when I was fourteen. At least it seemed that way for far too long. I didn’t expect her to die when she did. I wasn’t prepared. I hadn’t taken notes. I didn’t know what they would do with all her preserves, and I wept. There just didn’t seem to be anything to be done about any of it. It was hard, losing her, and for a few weeks I tried to pretend it simply hadn’t happened. She was like a second mother, and it appeared to me like some impossible necromancy to attempt to make that cornbread, so I just never did. Grandmother was dead, and cornbread was over. That was just how it was or so it seemed. Around the time she passed away I was beginning to develop that girlish sort of madness common at that age, and over the course of my adolescence I drifted farther and farther into the self-obsession that is being a teenager, and by the end I’d forgotten about cornbread, fireflies, badminton, and all that. But. That was not that. Our lives are like layers of soil, histories heaped upon histories, stratified by the major events in our lives. We can rediscover all manner of fossils and artifacts, and in turn fertile topsoil can cover the volcanic ash of the past. We have an infinite capacity for growth, rediscovery, and change, and as I’ve gotten older I’ve rediscovered many things: my feet on the earth, the kitchen, and Tennessee. In this past year I’ve also put many things behind me, and as I form a new layer in the geological history of my life there is again cornbread and cast iron and therein lie fragments of the intricate, complicated histories of both myself and the south. Cornbread in milk (or buttermilk) is an older southern midnight snack: when the day’s cornbread had become dry it was torn into pieces and soaked in milk and eaten with a spoon. Last month I sat at my dining room table and eagerly crumbled a piece of cornbread into a glass of raw milk for the first time in fifteen years. The taste possessed the same immediacy of memory as a familiar scent. I almost cried. I was effervescent, prattling on in excitement about how “it’s just like…just like”. None of it was gone at all, not her, not cornbread. 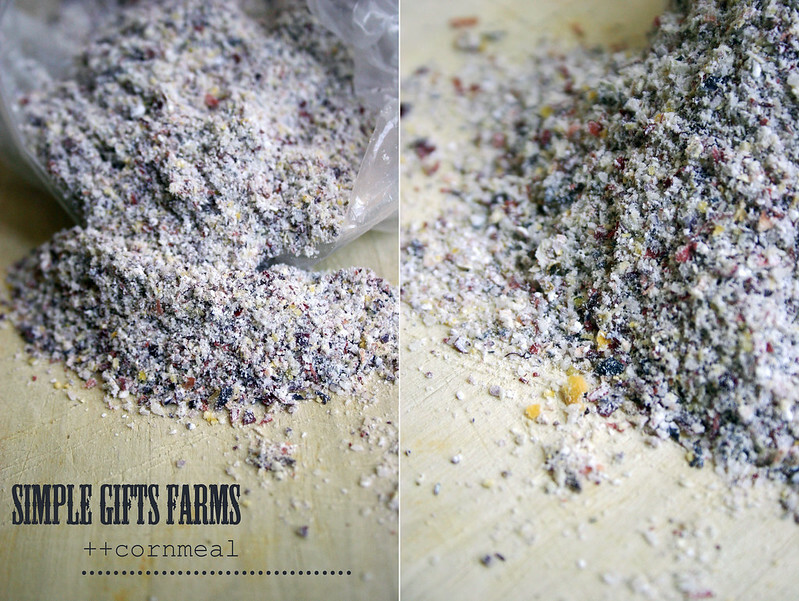 As for the ingredients, I use freshly milled corn from both Simple Gifts Farm (a beautiful roughly hewn mix of blue, red, and yellow corn from the Signal Mountain market on Thursdays) and River Ridge Mills (a finer textured yellow corn from the Main Street market on Wednesdays). 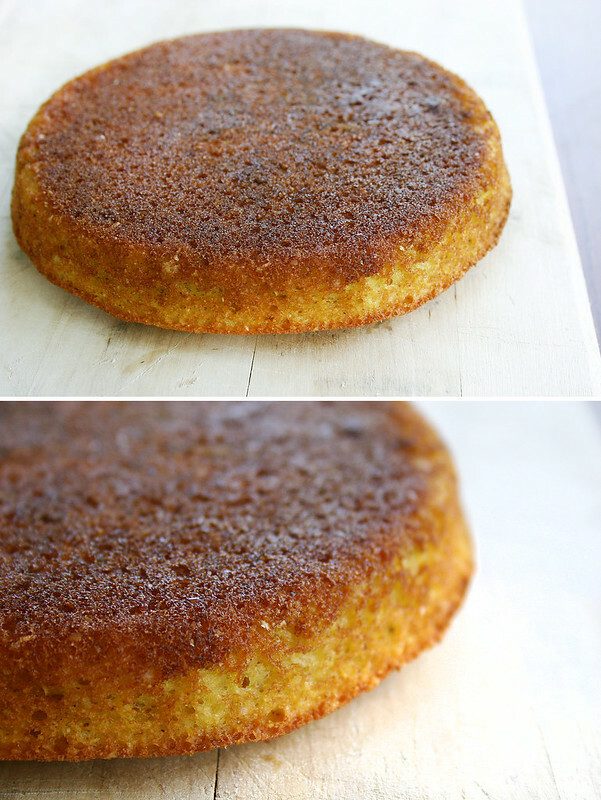 I prefer to use the former for the coconut cornbread and the latter for the buttermilk as it gives it the most traditional taste and texture, the one I remember. I use Cruze Farms Buttermilk and bacon grease from Link 41 bacon that I save in a dedicated mason jar. I often use canola oil or coconut oil in place of the bacon grease in the buttermilk cornbread, content to merely smear the bacon drippings on my pan. Whether you like it slathered in butter or drizzled with honey, plain or with milk like I take mine, each of these two variations has it’s own virtues. So I give you cast iron cornbread, two ways: the classic buttermilk and bacon grease cornbread of my youth and my own nouveau southern interpretation using coconut oil and cultured coconut milk. Southern food is an ever evolving, living organism with new innovations constantly being born of traditional recipes, and I think making the food your own is important. It keeps our cuisine vital. So feel free to play with fats, the cornmeal, the liquid, and various flavorings. I’m a purist so I don’t tend to put cheese and the like in my cornbread, but that doesn’t mean you can’t. These recipes are blank slates for endless sweet and savory variations if you like. Heat oven to 425°. Grease a cast iron skillet with bacon grease and place in the oven while it heats. Mix the first four ingredients in a medium mixing bowl. Cut in the fat with your fingers or two knives, mixing well until you have a sandy texture. Combine the eggs and the buttermilk, add to the dry ingredients, and mix to combine well. Add the baking soda and stir to combine. Pour the mixture into the hot skillet and bake for 20 minutes. Invert onto a plate. I like to serve it upside down with the nice crispy side up like she did. Substitute 3 Tbsp refined coconut oil (you need refined coconut oil as opposed to unrefined to withstand the heat of baking) for the vegetable oil, and 1 cup of cultured coconut milk (can be found in the dairy aisle usually next the kefir) for the buttermilk. Grease the skillet with the coconut oil as opposed to bacon grease. Your writing about your grandmother literally brought tears to my eyes. I don’t remember my Mimi baking cornbread, but she grew roses on the side of the house and the first one was always mine. I catch a waft of a certain kind of rose, and there she is. Wonderful read, and thoughts on childhood and live and the archeology of it all. Love your pictures too, you can see every little grain of that cornbread. Yum. I never had a grandmother and grew up a world away from the South, but after reading this post, tasting that cornbread might just give me a glimpse of it, of another life. Thanks for sharing. I’ve been obsessed with ancient history lately hence the archeology metaphor.. I kept thinking about phases of my life and how I could almost see the layers. I felt like identifying the phases and events that created the different layers or epochs of my life could help me better understand it and better understand me, just like archeology. I just discovered your beautiful blog via Poires au Chocolat. To my shame, I think I’ve only ever eaten cornbread once, and have definitely never made it. Reading this I’m inspired to give it a go. There are many different schools of thought on cornbread, but this is my favorite. Let me know if you give it a go! What a beautiful post, the colored grits are gorgeous, I have to go and find some. Your photography is very evocative, so glad I discovered your blog! I was *so* excited when I found this ground corn! 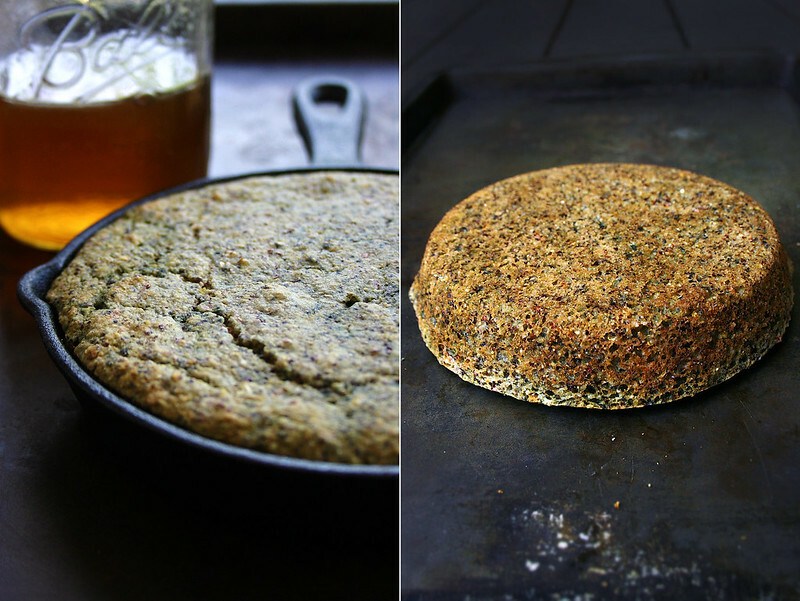 It makes for such interesting cornbread w/ such a rustic texture. Such a beautiful story, thanks for sharing! I’ve never seen cultured coconut milk before, but I’ll certainly try to seek it out. Do you think it is something that could be cultured at home, like home made yoghurt? It really was amazing. I think since taste is closely related to smell it really can powerfully evoke memories the same as scent. That first spoonful of buttermilk cornbread in milk was just like sitting at her dining room table. It was so nice to be able to reconnect to those pleasant memories that had been so obscured by time and all the difficulties of teenagedom + young adulthood! I know this response is years after the initial post, but the truth is the truth and always will be! Taste and fragrance will always bring back long forgotten (or so I thought) memories. Keep up your beautiful site….I LOVE THIS!!! wonderful post – what a tribute to your grandmother and her sisters. the cornbread looks delicous and i would love to make it but i don’t have a skillet 🙁 could i make it in a 8×8 pan? or as muffins? though i guess i wouldn’t have that wonderful crispy texture yours has would it? The one thing I don’t usually compromise on is the skillet. That said, yes, you could use and 8×8 or a muffin tin. It wouldn’t fail. Cast iron skillets are super cheap though. You can get a Lodge skillet for under $20 bucks easy. 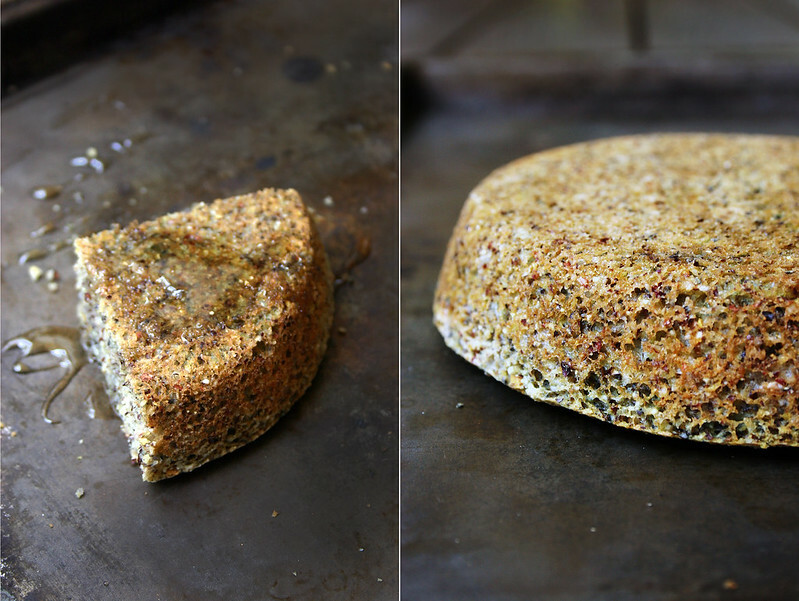 I *highly* recommend it… a well seasoned cast iron pan can’t be beat & has endless uses! Food truly is an excellent connection to people dead and alive. I unfortunately did not have the closest relationships with my own grandmothers, but I recently stumbled upon a collection of both handwritten and typed recipes my grandmother compiled years ago. Using those recipes and adapting them with my own hands will bring me closer to the careful love and attention my grandmother gave to her family and craft, as well as restoring her love of cooking and baking through me. After all, she saved them for a reason. Wonderful post about your grandmother and the archeology of life. It’s important to remember that soils are rich with histories upon histories of food, memories, and lives. I would really die to have a tangible collection of my grandmother’s recipes (my mother’s mother). She didn’t really have recipes and just did them by memory and feel… and as I said none of us were really prepared. But with the help of my Aunt & a little experimenting I’ve been able to recreate the most “important” recipes (biscuits, cornbread, fried okra… etc!). I was lucky with my other grandmother because I was able to have her teach me her signature dishes (chocolate meringue pie especially!) before she passed away. And recently my significant other’s mom gave me some family recipes of theirs… very exciting! It’s so important to get family recipes while people are still living if at all possible… I wish I’d known that then! I must admit, I got a bit choked up reading about the intimate memories of your precious grandmother. Many times I have had tears in my eyes…regretting, that recipes had not been passed on, or perhaps, paid more attention in the kitchen with the grandmothers in my life. Thank you for sharing this proven recipe and a touching piece of your life. I too had a lot of regret, which is why I think it took me so long to approach the recipe. Going with the archeology metaphor it’s kind of like finding a shattered pot and glueing it back together. That’s the great thing about regional cooking, with a little research (especially info from family members, but the googles helps too!) you can often find that magic method and recreate something you thought you lost. I too had a grandmother who was an awesome cook ,she also loved trying new receipes and had a vegetable garden and canned her vegetables I learned many receipes and how to can from her so remind everyone to take the time to teach your grandchildren even though it’s easier to do yourself. My grandmother lived with me her last few years and I had many of those hand written receipes I was going to try but alas Katrina took them all with many precious pictures so make sure you share receipes with others wo you can get them back. God bless all of you. This is gorgeous. All of it. I love how you write. Thank you! Hearing that people like my writing is as important to me as the photos and food because before anything… I was a writer! 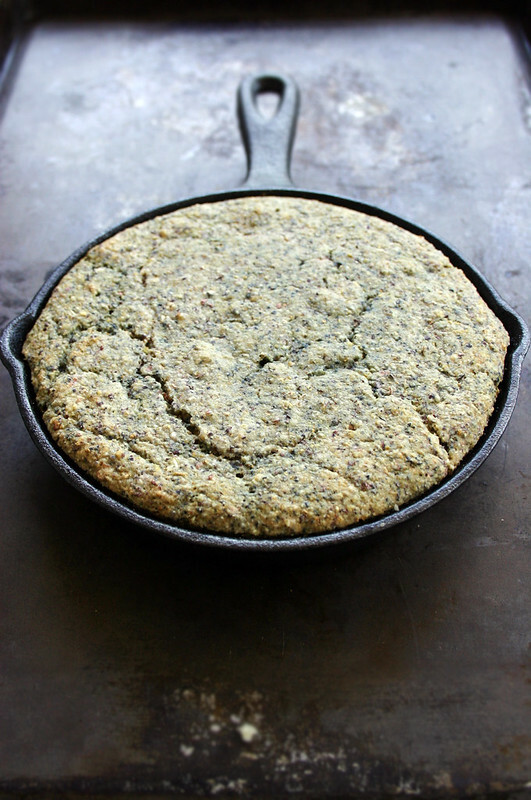 I have been looking for the “perfect” southern cornbread recipe. I just found it! Oh my goodness. The buttermilk and bacon grease make for a divine combination. I added a teaspoon of sugar to mine, and it turned out beautifully. Also, thank you for your wonderful stories. You have a way of weaving so much texture and beauty into each and every blog post. I find myself saying, “no…no…the post is coming to an end” and then I sit and pout about it for a few minutes, wishing I could know more. You make me long for a book – a book of your wonderful stories and history and experiences – fiction or non fiction – makes no difference to me. I think you could pull off either. First and foremost, I’m so glad the you liked the recipe… all the photos and writing would rather be for naught if the recipes weren’t any good! I’m very happy you liked it. It’s a piece of my history. Secondly, I really can’t thank you enough for your kind, encouraging words. It’s comments like that that keep me coming back each day to keyboard, camera, and kitchen to create things to share. I secretly (okay, so now not so secretly!) hope very much to write a book one day. It’s been a goal since childhood. It’s good to know I’ve got at least one person out there in the world who’d want to read it! See I told you. Your writing is really excellent, really Southern, much like Eudora Welty or even Willa Cather (not Southern). I think I have a decent vocabulary, but I find I almost always need a dictionary to look up a word – like autodidact. I now find it is one of my favorite words. Your cooking skills are really outstanding (I need a better word.) Where did you learn to cook like this? Do you work as a chef or would you care to share your background? I hesitate to ask since you have been really generous in your writing, so just tell us what you are comfortable with. I have been writing about my grandmother also. It all started with her cakes. When I quizzed my sister she did not remember them – she is a savory girl. So I went on a search of our ancestry and found where the family (ggggrandmother) came from France which I knew, but explains the genoise and yogurt cakes she used to make. While searching I found the ships passenger list, which I found extraordinary. I now know more about the cake recipes that I took for granted as a child. Thanks for the support… I’m glad my sometimes weird vocabulary isn’t off putting! I’m a lover of words, especially ones that don’t see the light of day much. They need love too. My mother got very into genealogy a ways back and we discovered, along w/ our already known Irish roots (my last name, Kirby, is Irish), a good bit of French. Unfortunately that never really appeared in the family cookery, though I’m bringing it back! It’s so fascinating, history both personal and global. I firmly believe we cannot know where we’re going without knowing from whence we came! Yum! This looks amazing! I rarely make cornbread because I usually find it too dry, but your recipe looks wonderful. The cultured coconut milk is especially moist. My other half isn’t crazy about cornbread for the same reason, and he really took to that one. You can subscribe via a reader or follow via email up on the right sidebar! I think that’s what you mean, right? I’m really just learning some of the finer points of blogging… I should be better! I’m slobbering at the coconut milk cornbread. And such stunning photos. It’s high-time I added you to my list of inspirations! You should try it… it has the most subtle flavor of the coconut milk when done and the same slight tang of buttermilk but is even more moist… really a win. 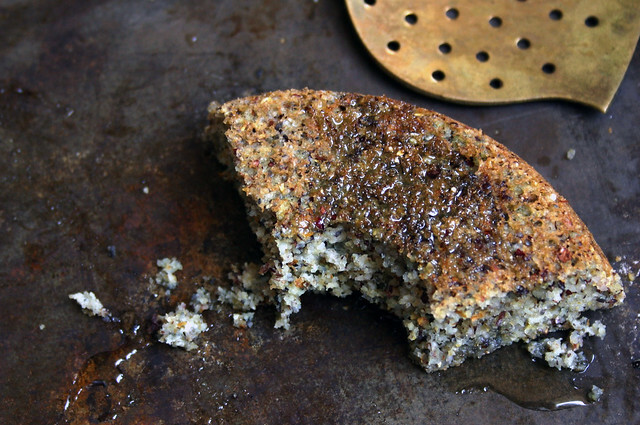 Ahh, I love your blog so much, and this cornbread looks amazing. 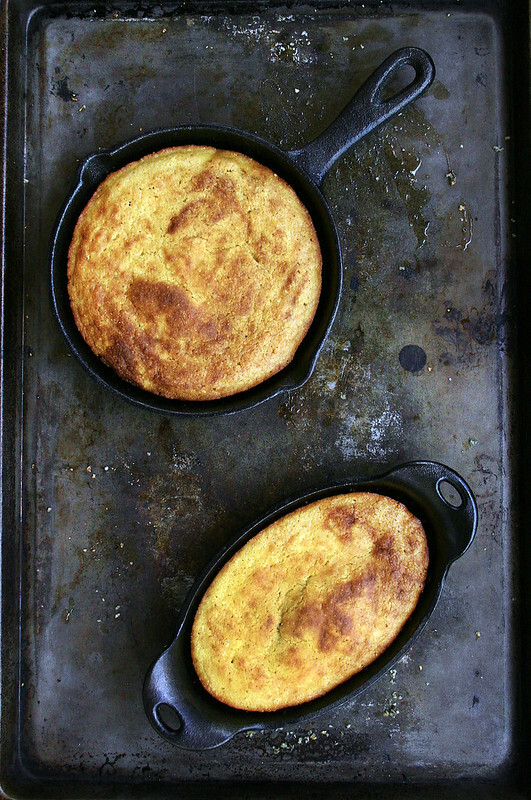 I’m pretty obsessed with southern cornbread, even though I’ve never actually even been to the south! Thanks for this recipe (and the beautiful writing) – the cultured coconut version sounds so interesting, and I’d love to try it! I feel the obsession. If I had my way I think I’d live off of cornbread & biscuits. Unfortunately I’d be malnourished. The cultured coconut milk helps with that though… making cornbread a bit more viable as a major component of my diet! What a touching post – the power food has to transport us is incredible. Your photos have convinced me that a skillet is a kitchen necessity. hi there. 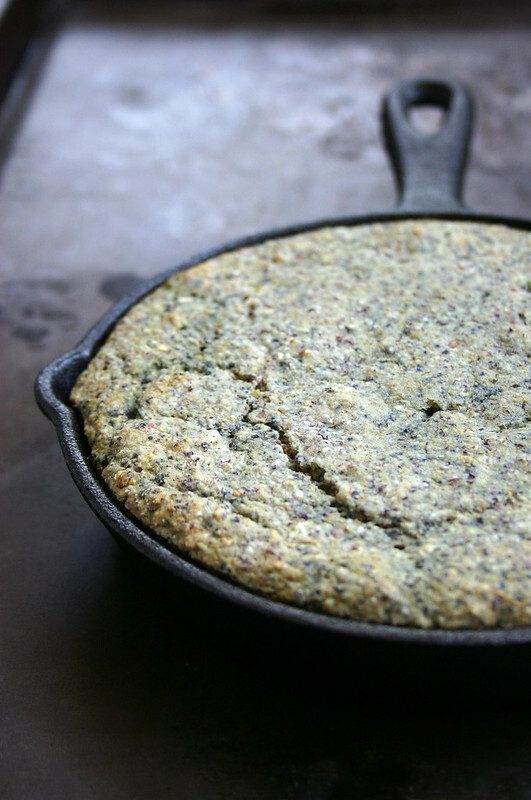 i LOVE you blog do you know where/if we can buy the blue cornmeal online? thank so much! I scored mine at a local farmer’s market, but if you google it, I bet you could find it! Thank you so much for the cornbread recipe. It sounds very close to how I saw my Grandmother make it and I have her Cast Iron skillet, I can’t wait to try it. One thing she use to do is the next morning crumbled it up and sprinkle with suger and at milk makes a great breakfast treat. Hey there! Were you somehow able to make all the settings of your blog by yourself or you turned to professionals to get some help? I did everything except my cousin, a graphic designer, designed the logo with me. My dad used to eat the leftover cornbread in a glass of milk. Never a bowl, always a glass. Looking forward to trying your recipe; Dad would have approved the amount of sugar (none)! Cornbread is made at least twice a week at my Arkansas home.my grandmother who passes away at the age of 94 about 5 years ago, made it every day. It was a staple with her and grandpa. I have even made it with corn that was raises in her garden, then ground into meal. Good cornbread is best when the mixture is poured into a very hot iron skillet and cooked in a hot oven!!! You get that wonderful crust by doing this. Try putting 2 tablespoons of pure butter in the skillet, put into the hot oven until the butter begins to turn brown at the edges then pour your batter into it and bake until it is nice and brown on top. Its wonderful. Save leftovers in the freezer for when you want to make chicken/turkey and dressing…that’s what we southerners call “cornbread” dressing. Good stuff.!!!! An alternative to janice’s idea with the butter is one I learned from my Mom (who got it from the mother of former Texas Gov. Bill Clements, who attended the same church). Basically, the idea is to combine fat & flour in that iron skillet on the stove and make a roux (I mostly use bacon fat, ‘natch). Just a few tablespoons each, depending on the size of your pan. Once that roux is brown, but not too dark, spread it out evenly, pour in your cornbread batter, and pop that skillet in the oven to bake. Great way to get that delicious brown crust on the bottom. I used an 8-inch skillet and it turned out fine, although it didn’t rise as high as in the pics. Sorry for the confusion. I use many different sizes depending. I usually fill the pan about halfway full. If using an 8″ I use it all and yes it’s thinner. These were made in 4″ minis. Its all delicious! But the biggest this will make is 8″. Wow, thanks for your blog. This got me thinking about my dad. My mom would make corn bread like Jiffy Mix. It is sweet. My dad would never eat it during the meal. He always said it was like desert. He was used to the corn bread like you make. He grew up in the south and that is what he was used too. Thanks for this oportunity to bring back memories. I really enjoyed reading your post about your Grandmother’s cornbread recipe. I have a similar experience. My Grandmother (Mama to all of us grandkids)was a fantastic cook and we all looked forward to holiday trips to her home in North Carolina and the goodies that awaited us there! Mama’s cornbread recipe is close to yours. An exception is that we use solid shortening (not the Lard that Mama used) and heat it in the skillet and then pour that into the mix, stir well and immediately pour back into the hot skillet. Ah, this makes the greatest crust on the bottom of the bread. My Dad used to break the cornbread into a glass of buttermilk (UGH!! )and eat it with a spoon. My siblings and I nicknamed the mixture “Chug Polly”, which conveyed our dislike for that idea. This cornbread also is the greatest basic ingredient for a recipe for dressing to accompany a holiday turkey meal. This dressing should never be crammed into the hollow carcass of a turkey! The flavor is derived from using the broth from the turkey in the dressing!! Wonderful memories are brought back to mind every time I make this. I too had a grandmother that died when I was 15. She was a wonderful cook and I have always regretted not learning how to cook from her. She made a wonderful chicken casserole that was my absolute favorite and I crave it to this day…I love cornbread and I will try your recipe. Thanks for sharing! I’ve never seen your blog before, but I’m now a fan. Very eloquent and very evocative. I was blessed to have both my grandmothers for a long time, but I missed getting some of their recipes and stories. I do have some good ones from them, though, and I learned to can preserves and tomatoes and pickles from them. I feel close to them when I prepare those recipes they taught me. I think of both of them every day. One of her strongest insults was, “She uses cake mix.” That was nearly as big a sin to her as using Sure-Jel to make preserves. I have my paternal grandmother’s diary that she kept as a young woman during World War Two. They had children and took in boarders, and she made several cakes a week. Thanks for creating a place where people feel comfortable sharing these kinds of stories. Scone – without raisins please and fried in bacon grease as a treat on a Sunday morning along with Potatoe Bread made with mashed potatoes and rolled thin and also fried in bacon grease. rhis as well.. Will definately try your Corn Bread Recipe and I have an old seasoned cast iron frying pan courtesy of my Father in Law who made breakfast at the cottage every Sunday. When returning from winters in Florida we love to stop in Pigeon Forge and I try to stock up things I cannot buy in CAnada….. I love cornbread and I also use my grandmother’s recipe. This is something different and I have to prepare your variant. I can hardly wait. I’m obsessed with the beautiful spatula/turner. Is it copper? Wood? Making your cornbread for the second time this week-it’s so good (reminds me of my Daddy’s)! Do you think the batter would fill (or overfill) a 8″ or 9″ skillet if I doubled the recipe? I bake for my coworkers every week and they would go bonkers over this. A 9″ might be alright. But it would be much thicker and the cooking time would need to be adjusted accordingly. Maybe bake in two 8″ batches? What a touching read. My grandmother is thankfully still with us, though we’re separated by an ocean. Still I was brought to tears by your story. I know the meals that remind me of my own grandmother, and when I make them it’s like we’re together in the kitchen as we have been in the past. I have leftover bacon grease (which is how I found this by googling) and I was planning on making corn bread today too! I’m excited to try this, thank you, and your grandmother. Pingback: Southern Classics | Buoy. YES!!! I can’t WAIT to try this recipe!!! TRUE, SOUTHERN cornbread. No sugar and very little flour!! This was exactly how my grandmother made cornbread too! The more grease in the pan when heating the more crisper the outside is. I pour grease in bottom of pan and let that heat like you do. But I also add 1 teaspoon of sugar like taught. I learned from my grandmother and father. Also learned how to eat cornbread in buttermilk from them. Thanks for the memories. I grew up eating buttermilk and cornbread. I still rip up my cornbread and pour buttermilk over and eat it with a spoon. Brings back good memories. My father was from Russel Co., VA but grew up in East TN. I will be making a skillet of bacon grease cornbread tonight and will have wonderful memories of summer vacations in East Tennessee while visiting my cousins for 2 weeks every year. Love your remembrances of your grandmother. My grandmother made fig preserves every year and always put the first jar on top of the cupboard. When we went to visit months later, I would look for my jar and it was still there. Brings tears just telling it again. Thank you. Hi Mary, thanks for commenting and your kind words! So enjoyed reading this. I am that southern grandma. I raised my now 20 year old granddaughter. She has shown a huge interest in certain dishes I make in last two years. This has inspired me to compile my recipes with my own touches and comments for her. Just today, she sent a text asking for help on dinner. I gave her suggestions back via text. But she will need something to hold in her hands eventually. 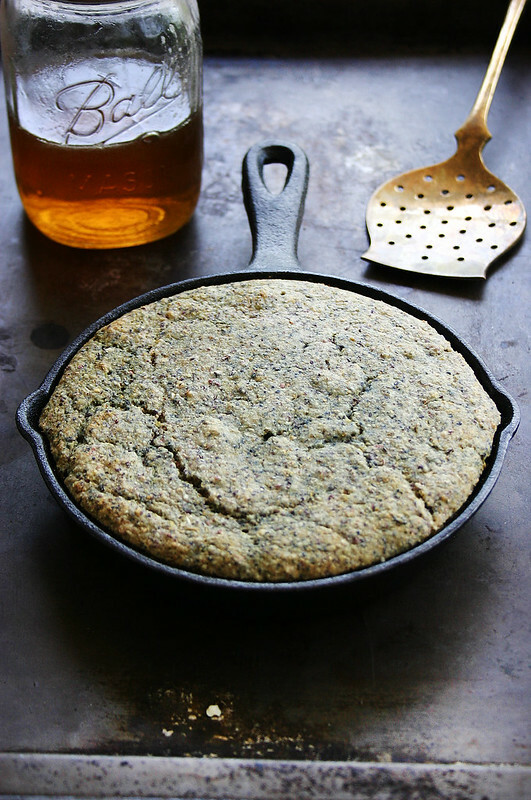 Your cornbread looks delicious, just never thought I’d cry reading a dang cornbread recipe. I also became teary eyed. I love my memories but sometimes they make me so” lonesome” I wish we could give our children their own memories of that era, but that era is gone forever. My girls think I’m trying to slowly kill them with bacon grease .lol They actually think that as long as they only eat my cooking once a week, it will not be that dangerous. My grandmother lived to be 86 years old. It must not be too bad.